I have fond memories of ice cream sandwiches as a kid, but I’d not had one that I could actually eat in over 7 years. Food sensitivities can really put a cramp in your diet until you figure out how to enjoy eating food again from cleaner, healthier sources. That said, the gluten free vegan ice cream sandwiches I’m about to share with you are made from grain-free, vegan, freshly baked cookies that don’t contain any processed sweeteners. Yes, you just read that last sentence correctly. This point is especially important because I’m not a baker… at all. In fact, I hate baking. But baking these were so easy that even I could (stand) to make them in about 10 minutes. Then you slather on about half of a serving of ice cream and you’re good to go! I know you’re wondering about the cookies already… so I have to divulge that I don’t have a recipe that I created for them. However you can find it HERE, but I’ve never made it (I don’t like to bake, remember?). Instead, the nice folks from Capello’s sent me a couple tubes of their pre-made cooking dough based off the recipe I just mentioned. They had NO IDEA that I was going to end up making gluten free vegan ice cream sandwiches with them and that they’d end up being such a hit on social media. The lovely ice cream used here is from So Delicious Dairy Free and is cashew-based. While I certainly have appreciated their vegan ice creams in the past, the cashew ice creams are by far the best dairy-free ice creams I’ve ever tried. I used the Creamy Cashew for my ice cream sandwiches. That’s why I decided to share this treat with you all because I know what it’s like to occasionally want to indulge in treats that aren’t loaded with junk and that are in line with the diet you follow. I also know that not everyone likes to or is good at baking. Sometimes you just want to eat something you’ll enjoy without breaking all of your diet’s rules. Now you might be wondering why exactly I chose to create an entire recipe post when there’s not much of a recipe to share since both components were essentially store-bought. Well, I got so many requests for the recipe I figured I’d clue you all in on exactly how I make it. One neat thing that I came to discover about this “recipe” is that once you make your ice cream sandwiches, they can last up to several weeks in the freezer in a well-sealed container without any loss of flavor or quality (I stored mine for about 3 weeks). This means that you could make a batch and pull one out to enjoy at your leisure. They are in a single serving form and prevent you from eating an entire container of your favorite non-dairy ice cream or all of the cookies in one sitting. Perfect for the summertime, I think you’ll totally enjoy these gluten free vegan ice cream sandwiches. A sweet treat for you (or kids), these ice cream sandwiches are a total upgrade from the highly refined versions of your former gluten-eating days! Deliciously creamy, vegan ice cream sandwiched between two grain-free, fresh out of the oven chocolate chip cookies. They're easily assemble them in minutes with upgraded, healthier ingredients that everyone will love! Follow instructions on the side of the Cappello's Cookie Dough wrapper to bake the cookies. Be VERY mindful to not bake them beyond 10 minutes because they could burn. Once cookies are removed from the oven, allow them to cool. During this time, you may want to take the ice cream out of the freezer to allow it to soften up and be easier to work with. After cookies are cool, scoop about 2 tablespoons or so of ice cream. Place one cookie upside down and gently spread out the ice cream evenly. Then place a second cookie on top and voilá! Eat immediately or store in a container in the freezer for up to 3 weeks to eat as you please. Call me Australian but how is this a “recipe”???? Penelope, as I point out in this post… it’s not. I got so many requests for how to make it, so I decided to share and also let readers know that you can freeze these and eat them later. And that there is a cookie recipe available online if you like to bake (unlike yours truly). Keeping it a bit light this week because things are pretty hectic around here. Back to some hard-hitting stuff next week. Gloria, you may have been referring to the recipe I’d link which until a moment ago does contain eggs. I’ve since changed it to their vegan version. 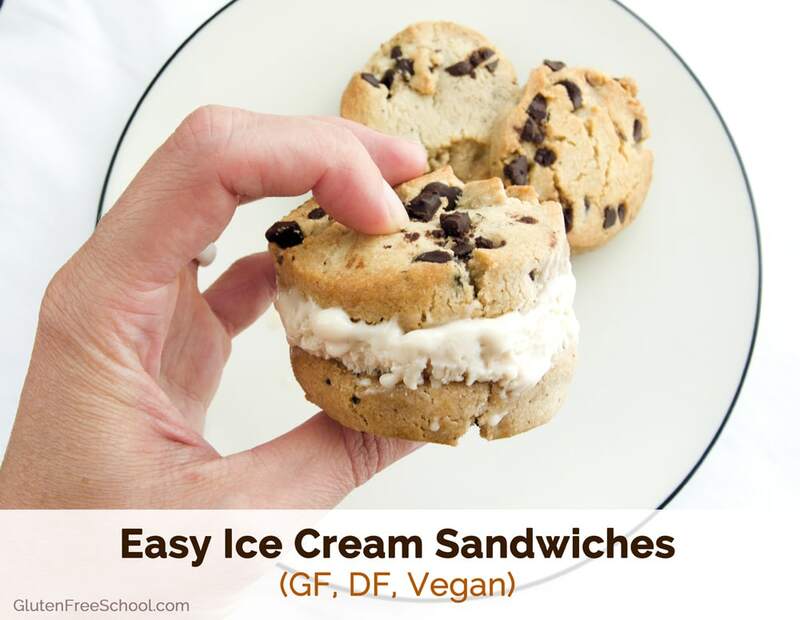 That said… this recipe on GFS for the ice cream sandwiches IS vegan. The cookie dough from Cappello’s is vegan. There are no eggs in it. I am highly sensitive to eggs, so I’d not make something like this if it had eggs in it. Rest assured, you now have the vegan recipe for the cookies if you want to make them from scratch yourself! These look delicious!! Thanks for the great idea!